As people age, they may require some level of assistance or care to help with issues such as health problems, decreased mobility, or other age-related factors. Fortunately, a number of elder care options exist that can help senior citizens enjoy the best quality of life possible. Learn about the different types of elder care options available to you. Most senior citizens want to maintain their independence for as long as possible. Remaining in their homes is an important priority to many. A variety of care options can help seniors to remain at home. The cost of this help is typically an hourly rate. It may only be a few hours a week, or it may be full time. Health insurance will most likely not cover any of the cost for help. Workers in this capacity may earn minimum wage or a few dollars per hour above this rate. Seniors may also be able to find volunteer organizations that provide in-home help. Hiring help around the house works best for senior citizens who are mostly independent but are just finding it more difficult to maintain certain tasks around the house. This type of care will not work for seniors with significant health or mobility issues, or for senior citizens with dementia. It is not a solution for senior citizens needing a great deal of additional help or healthcare. There is potential for abuse. No certifications are required, so careful screening is essential. Some seniors may require companionship. Seniors may need companions for an array of reasons, such as they have no relatives living nearby, or they need help completing tasks such as going to doctors' appointments and grocery shopping. Companions are typically with senior citizens during the day, although some also live with the senior citizen to provide assistance at night. If a companion is required to provide medical assistance such as helping administer medications, then she should have some type of a nursing credential such as CNA. Otherwise, companions don't necessarily need credentials to work with the senior. Companions may work part time or full time, depending on the needs of the senior. Costs vary depending on hours, tasks, required skills, and area of the country. Costs range from a few dollars above minimum wage per hour to $5 or more above minimum wage. Credentialed professionals will cost more. Health insurance most likely will not cover a portion of these costs. This type of arrangement works best for a senior citizen with minimal care needs who just needs some additional help or companionship. It is not the right arrangement for a senior citizen with significant physical or mental health issues. Someone is there to monitor the senior for loneliness or depression. Someone is available to drive seniors to appointments and other places. The senior citizen can have help for tasks as needed. Hiring a companion can make life easier for the senior citizen. There is potential for abuse if applicants are not carefully screened. Compared to hiring for household help, it is fairly expensive. Unless hiring a certified healthcare professional, a companion is not trained to administer any medical care. Because home health care requires specific medical certifications and skills, costs may be significant. Costs vary depending on the level of care required and the licensing of the healthcare provider. Some costs may be covered by Medicare, Medicaid, and supplemental insurance. For more information about who is eligible for Medicare Assistance, visit Medicare.gov. According to LongTermCare.gov, the average cost of home health care in 2010 was $21 per hour. This type of situation works best for seniors who have need for skilled nursing care due to medical conditions. It may not be appropriate for severely ill seniors, or those with dementia requiring round-the-clock monitoring and supervision. Allows the senior some level of independent living. Senior lives in comfortable and familiar surroundings away from more institutional settings. A skilled healthcare provider is on-premises to help with health management and emergencies. It is a reasonably expensive form of elder care. It may require expensive medical equipment or machinery. Health insurance may not pay for all costs, or the senior may not be eligible for health insurance payment of home health care. Some seniors require a higher level of care than is available with home health care. 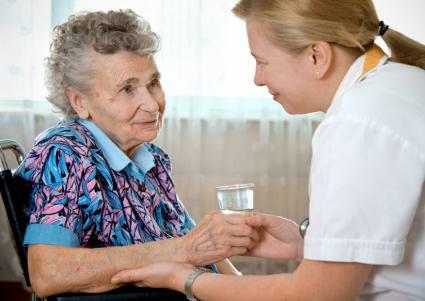 Hospice care is appropriate for senior citizens who are in the end stages of disease. It is not appropriate for seniors without a terminal illness. Costs of hospice care are mostly covered by Medicare and Medicaid provided eligibility is established. Some minor fees may apply such as a per diem for respite care. In some cases, elderly people may be in a situation where it is more appropriate to live in a care facility. Different levels of facility are available based on the needs of the senior citizen. These types of communities are for seniors with few medical needs who are able to live independently. Costs typically mirror the cost of housing in the area, although meal plans will require an additional fee. These services are available but not required, and medical insurance does not cover them. Assisted living works well for seniors who have medical problems but can still live reasonably independently. It is not appropriate for people with critical illnesses, no mobility, or dementia. The cost of assisted living is higher than independent retirement communities, but less expensive than a nursing home. The cost of assisted living is about two to three times what rent on a one-bedroom apartment in the area might cost. Some long-term care insurance may cover some of the costs of assisted living. Medicare and Medicaid do not. Nursing facilities are appropriate for seniors who are not mobile, cannot care for themselves, are ill, or have dementia. They are not appropriate for seniors who can care for themselves or are able to live independently. Costs of nursing facilities are quite expensive. LongtermCare.gov notes a semi-private room in a skilled nursing facility cost an average of $205 per day in 2010, while a private room costs an average of $229 per day. If the senior citizen is eligible, Medicare, Medicaid, and supplemental insurance will pay for some of the costs associated with skilled nursing facilities. Many nursing homes focus on quality of life, offering activities and socialization. Skilled caregivers are onsite 24/7. The care is very expensive. Not all seniors are eligible for skilled nursing facilities. It is an emotional decision when it comes time to choose care for elderly loved ones, but is often a necessary part of life. Making an informed decision can help keep the quality of life as high as possible.